Upgrade any area of your home with stylish and durable ceramic tile. At our ceramic tile shop, we offer all types of quality flooring products to improve the look of any space. Our flooring specialists help you find the ideal tile to use for your design project. 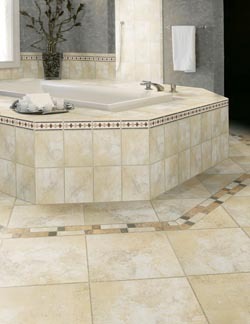 Turn to us for an efficient ceramic tile installation in your home. We offer a number of options in sizes, patterns, hues, and designs. With so many options you are sure to find the floors that best suit your needs in looks, performance, and price. Turn to our local ceramic tile shop to find quality-made tiles to enhance any space at home or work. Partner with our knowledgeable and friendly sales associates to compare different types of products. A great choice for high-traffic areas, tile from our ceramic collections is a smart option when choosing floors that hold up over time. This flooring works well in multiple rooms throughout the home, including living rooms, dining rooms, kitchens, bathrooms and more. Resistant to stains and water, spills clean up easily. Do not just limit yourself to the indoors. Ceramic tile also works well outdoors. Think about placing it around a pool area or in a sun porch. The possibilities are endless. Additionally, our products are affordably priced. We make it a point to keep our prices competitive, as we want to help you save money. This means you’ll be able to stay within the budget for your home improvement project. Hire our professionals to complete your ceramic tile installation. With our installers on the job, you are protecting your investment and guaranteeing its looks and longevity. Our team uses the right tools and industry practices to put in our products. When you turn to us, we’ll plan your installation when it’s convenient for you. We start your installation by removing furniture and items from the rooms. From there, we’ll get rid of your existing floor and then prep the subfloor. After the subfloor is prepped, we apply a strong adhesive to the floor. Tiles are cut to size as needed and placed on the top of the adhesive. Spacers are used to set the tiles apart from each other. Once everything is installed properly, we’ll let your ceramic tile floor set for at least 24 hours. The next day, our installation team completes the last step of the process. We’ll grout the joints between the tiles. It’ll take 15 to 30 minutes to dry, and your floor will be complete. You can’t go wrong by choosing a tile floor made of ceramic. Besides giving spaces stunning new looks, it also has many other advantages. It is perfect to use in high-traffic areas, like hallways and entrances. Ceramic tile flooring also works well in multiple rooms through homes, including living rooms, kitchens, bathrooms, dens, and dining rooms. Contact us to find elegant ceramic tiles to transform the look of any space in your home. We cater to customers in Greenville, Greer, Spartanburg, Easley, and Anderson, South Carolina.